On 6 October 2016 Mastodon was launched, and its originator Eugen Rochko looks back in a blogpost on the journey of the past two years. 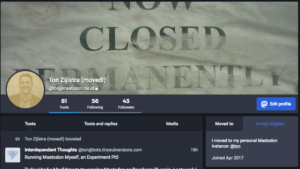 I joined on 7 April 2017, 6 months after its launch, at the Mastodon.cloud instance. I posted some messages for a month, then fell quiet for half a year. A few messages last March, and then I started using it more frequently last month, in the run-up to figuring out how to run Mastodon for myself (which for now means a hosted solution, but still aiming for running it from the home router). It’s now part of my daily information diet, but no guarantee yet it will last, although being certain I have ‘my half’ of the conversation on a domain I own helps a lot towards maintaining worthwhile exchanges. Eugen’s blogpost is rightfully proud of what has been accomplished. It’s not yet proof of the sustainability of federated solutions though as he suggests. He shares a few interesting numbers about the usage of Mastodon. The median of the 3460 known instances is 8 users. In total there are 1.627.557 registered accounts. The largest instance has 415.941 members, while the top 3 together have 52% of users, meaning the number 2 and 3 average 215.194 accounts. The top 25 largest instances have 77% or 1.253.219 members, meaning that the numbers 4-25 average 18.495 users. As the median is 8 it means the smallest 1730 instances have at most 8*1730 = 13.840 users. It also means that the number 26 to number 1730 instances have at least 360.498 members, or an average of 211. This tells us there’s a Pareto power law distribution: the top 20% of instances hold at least 85% of users at the moment. That also means there is no long tail, just a stub that holds at most 15% of Mastodon users only. For a long tail to exist, the smallest 80% of instances should account for over 50% of users, or over three times more than the current number. 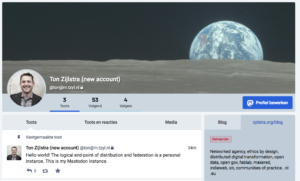 As the purpose of Mastodon is distribution, where federation allows everyone to connect regardless of their instances (sort of like e-mail), I think Mastodon can only be deemed sustainable if there is a true long tail. Meaning, that while the number of users goes up, the number of instances should go up at a faster rate. So that over 50% of all Mastodon users will be on the 80% smallest or even individual instances. In the current numbers we should be most interested in the 50% of instances that now have 8 or less users, and find out what drives those instances, so we may have many many more of them. We should also think about what a bigger-to-smaller-instances funnel for members can look like, not just leave it to chance. I think that the top 25 Mastodon instances, which is just 0.7% of the total, currently having 77% of all users is very problematic from a sustainability perspective. Because that level of concentration is completely at odds with the stated purpose of Mastodon: distribution. Eugen Rochko in his anniversary posting points at a critical article from April 2017 in Mashable, implying that criticaster has been been proven wrong definitively. I disagree. While much of the ‘predictions’ in that article are indeed silly, it also contains a few hints as to where sustainability may be found. The criticaster doesn’t get federation (yet likely uses mail everyday), and complains about discovery (yet likely is relieved not all his personal e-mail addresses are to be found in Google). Yet if we can’t explain distribution and federation, and can’t or don’t communicatie how discovery works in such a setting then we won’t be able to make a long tail grow. For more people to adopt small or individual instance we need to bring the threshold for running your own instance way down, and then way down again. To the level of at most one click installing a script on any regular hosting service, and creating a first account. Using open protocols, like ActivityPub which Mastodon supports, is key in getting more people out of walled gardens and silos, and on the open web. Tracking its adoption is a useful measure of success, but 2 years of existence is not a sign of sustainability at all. What Eugen Rochko has kicked off with Mastodon is valuable and very laudable, but we have barely started getting to where we need to be for it to stick. What Does Gab’s Demise Mean For Federation? The Twitter-like platform Gab has been forced offline, as their payment providers, hosting provider and domain provider all told them their business was no longer welcome. The platform is home to people with extremist views claiming their freedom of speech is under threat. At issue is of course where that speech becomes calling for violence, such as by the Gab-user who horribly murdered 11 people last weekend in Pittsburgh driven by anti-semitic hate. Will we see an uptick in the use of federated sites such as Mastodon when platforms like Gab that are much more public disappear? This I think isn’t about extremists being ‘driven underground’ but denying calls for violence, such as happened on Gab, a place in public discourse. An uptick in the use of federated sites would be a good development, as federation allows for much smaller groups to get together around something, whatever it is. In reverse that means no-one else needs to be confronted with it either if they don’t want to. 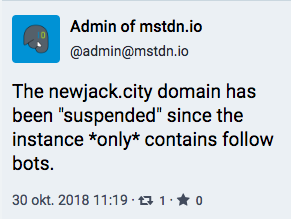 Within the federation of Mastodon sites, I regularly come across instances listing other instances they do not connect to, and for which reasons. It puts the power of supporting welcomed behaviour and pushing back on unwelcome behaviour in the hands of more people, meaning every person running a Mastodon instance (and you can have your own instance), than just Twitter or Facebook management. That sort of moderation can still be hard, even if the moderator to member ratio is already much better than on the main platforms. But that just points the way to the long tail of much smaller instances, more individual ones even. It means it becomes easier for individuals and small groups to shun small cells, echo-chambers and rage bubbles, and not accidentally ending up in them or being forcefully drawn into them while you were having other conversations, like what can happen on Twitter. See my earlier posting on the disintegration of discourse. 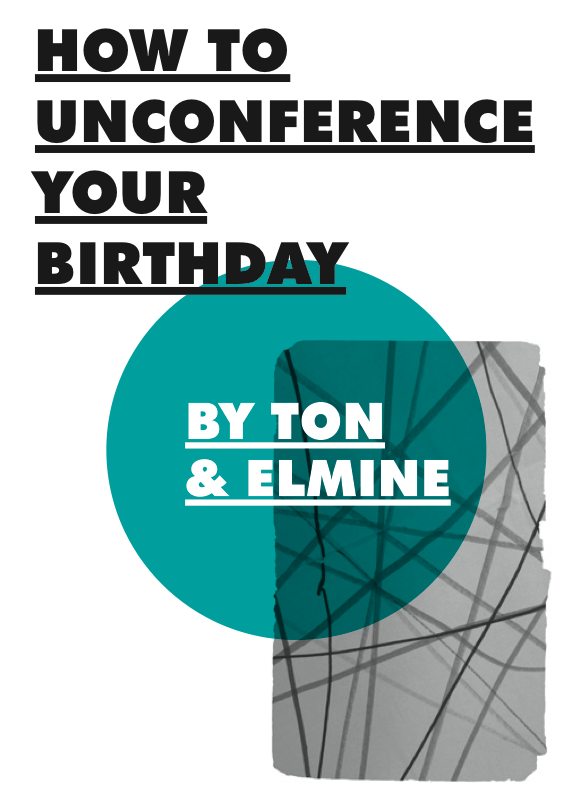 You then can do what networks do well: route around the stuff you perceive as damage or non-functional. It creates a stronger power symmetry and communication symmetry. It also denies extremists a wider platform. Yes they can still call for violence, which remains just as despicable. Yes, they can still blame Others for anything and be hateful of them. But they will be doing it in their back yard (or Mastodon instance), not in the park where you like to go walk your dog or do your morning run (or Twitter). They will not have a podium bigger than warranted, they will not have visibility beyond their own in-crowd. And will have to deal with more pushback and reality whenever they step outside such a bubble, without the pleasant illusion ‘everyone on twitter agrees with me’. As I didn’t succeed yet in getting Mastodon to run on a Raspberry Pi, nor in running a Gnu Social instance that actually federates on my hosting package, I’ve opted for an intermediate solution to running my own Mastodon instance. Key in all this is satisfying three dimensions: control, flexibility and ease of use. My earlier attempts satisfy the control and flexibility dimensions, but as I have a hard time getting them to work, do not satisfy the ease of use dimension yet. At the same time I did not want to keep using Mastodon on a generic server much longer, as it builds up a history there which with every conversation ups the cost of leaving. The logical end point of the distributed web and federated services is running your own individual instance. Much as in the way I run my own blog, I want my own Mastodon instance. Such an individual instance needs to be within my own scope of control. This means having it at a domain I own. and being able to move everything to a different server at will. There is a hoster, Masto.host run by Hugo Gameiro, who provides Mastodon hosting as a monthly subscription. As it allows me to use my own domain name, and provides me with admin privileges of the mastodon instance, this is a workable solution. When I succeed in getting my own instance of Mastodon running on the Rapsberry Pi, I can simply move the entire instance at Masto.host to it. Working with Hugo at Masto.host was straightforward. After registering for the service, Hugo got in touch with me to ensure the DNS settings on my own domain were correct, and briefly afterwards everything was up and running. 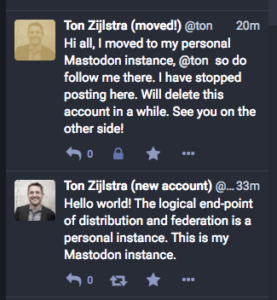 Frank Meeuwsen, who started using Masto.host last month, kindly wrote up a ‘moving your mastodon account’ guide in his blog (in Dutch). I followed (most) of that, to ensure a smooth transition. Using Mastodon? 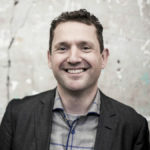 Do follow me at https://m.tzyl.nl/@ton. Screenshots of my old Mastodon.cloud account, and my new one on my own domain. And the goodbye and hello world messages from both. In the past few days I tried a second experiment to run my own Mastodon instance. Both to actually get a result, but also to learn how easy or hard it is to do. The first round I tried running something on a hosted domain. 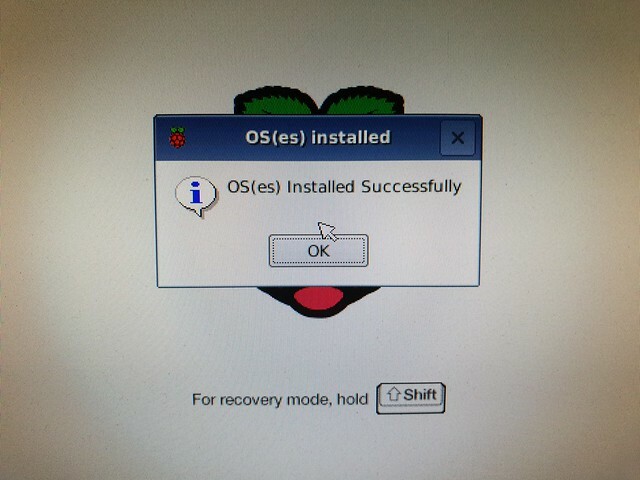 This second round I tried to get something running on a Raspberry Pi. The Rapsberry Pi is a 35 Euro computer, making it very useful for stand-alone solutions or as a cheap hardware environment to learn things like programming. I found this guide by Wim Vanderbauwhede, which describes installing both Mastodon and Pleroma on a Raspberry Pi 3. I ordered a Raspberry Pi 3 and received it earlier this week. Wim’s guide points to another guide by on how to install Ruby on Rails and PostgresSQL on a Rapsberry Pi. The link however was dead, and that website offline. However archive.org had stored several snapshots, which I save to Evernote. Installing Ruby on Rails went fine using the guide, as did installing PostgresSQL. Then I returned to Wim’s guide, now pointing to the Mastodon installation guide. This is where the process currently fails for me: I can’t extend the Ubuntu repositories mentioned, nor node.js. So for now I’m stalled. I’ll try to get back to it later next week.